The changing and breathtaking colours of some of our magnificent trees, together with flocks of visiting birds on their long migration journeys, and a bounty of fruits and seeds for them to feed on are proof that autumn has arrived. However, thanks to Pauline, on the 27 October we were witness to a less obvious clue if not, indeed, a very spooky sign of the season. We met along the disused railway, now a fantastic public walkway, starting behind the Co-op stores on Leeds Road, Outwood. 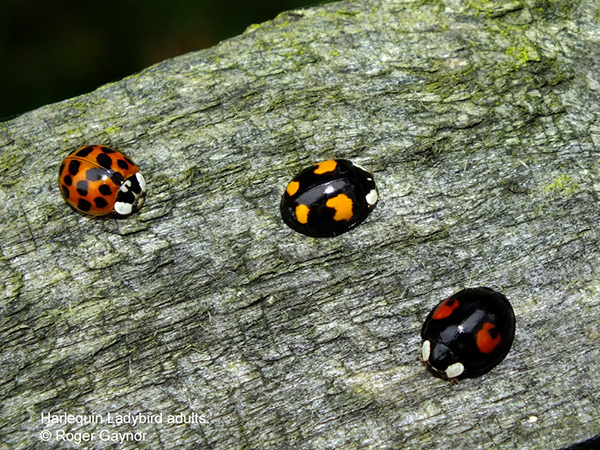 There, on the timber post and rail fencing we found hundreds of ‘Halloween ladybirds’ as they are known in the USA, because they gather in their overwintering areas during September to November before hibernating, often in buildings. Such large gatherings of insects are known as aggregations. Here in the UK this beetle is known as the harlequin ladybird (Harmonia spp) and is an unwelcome invader. The adult is very variable in appearance with a range of colours and patterns (see photos). Unlike many of our native ladybirds it produces multiple generations and a single female may lay up to 2,000 eggs in a lifetime leading to large populations. The life cycle then proceeds to a larvae (see attached photo), which can shed their skins several times before forming a pupae, and then after several days the adult emerges. 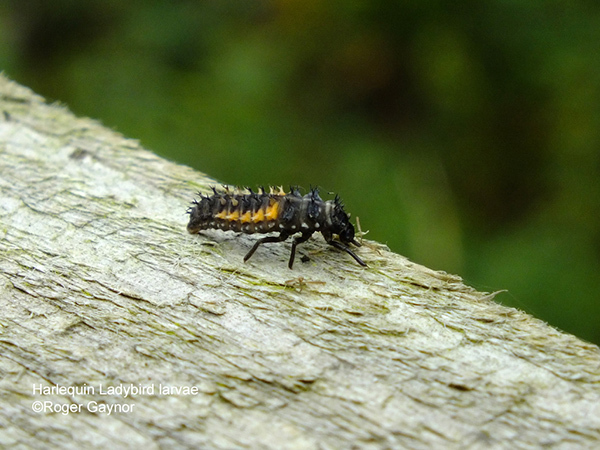 The larvae and adults feast on aphids and when these have been devoured they sadly eat and out-compete our native, treasured ladybirds, bringing a ghostly end to autumn.